Extra-stong Master Equipment Grooming Arms, made of zinc-plated steel, fit most grooming tables. Attach the arm to the table with the heavy-duty clamp, and adjust the height with easy-to-use knobs. Our Master Equipment Grooming Arms are equipped with heavy-duty, powder-coated aluminum clamps that opens to 1 1/4 and screw securely onto most grooming tables. The extra-wide clamp prevents damage to the table and increases stability. Made from extra strong zinc-plated steel. Adjusts up and down with easy-to-grip knobs so you can groom dogs of different sizes. 3/4" square arm includes an 18" grooming loop with a swivel snap. 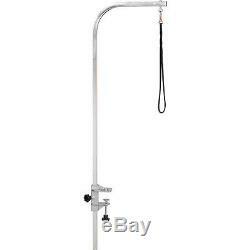 Material : Zinc-plated steel Size : 3/4" square arm includes an 18" grooming loop. We make every effort to describe the item accurately. The item "Master Equipment Portable Dog Grooming Table Arm 36 / 48'" is in sale since Saturday, December 5, 2015. This item is in the category "Pet Supplies\Dog Supplies\Grooming\Grooming Tables". The seller is "ilpets" and is located in Lake Forest, Illinois. This item can be shipped to United States, Canada, United Kingdom, Denmark, Romania, Slovakia, Bulgaria, Czech republic, Finland, Hungary, Latvia, Lithuania, Malta, Estonia, Australia, Greece, Portugal, Cyprus, Slovenia, Japan, China, Sweden, South Korea, Indonesia, Taiwan, South africa, Thailand, Belgium, France, Hong Kong, Ireland, Netherlands, Poland, Spain, Italy, Germany, Austria, Israel, Mexico, New Zealand, Philippines, Singapore, Switzerland, Norway, Saudi arabia, Ukraine, United arab emirates, Qatar, Kuwait, Bahrain, Croatia, Malaysia, Brazil, Chile, Colombia, Costa rica, Dominican republic, Panama, Trinidad and tobago, Guatemala, El salvador, Honduras, Jamaica.